Wondering what we will chant during our morning meditations (known as sadhana)? Unless we offer a “special event” sadhana, our morning mantras are always the same: the Aquarian mantras. Yogi Bhajan gave us the Aquarian Sadhana, which includes these mantras, in 1992. It was given to help prepare us for this new age of Aquarius, as well as to sustain us through this time. The Aquarian Age, which began on 11-11-11, is an age of experience. Thus, the truest way to know these mantras is through chanting them. The following 7 mantras are chanted each for a specific duration, in this order, for a total of 62 minutes. The Creator and all creation are one. This is our True Identity. The ecstasy of this wisdom is Great beyond words. This mantra is a code that directly links us to the creative Infinity of God. This is the first mantra Yogi Bhajan taught when he came to America, which implies its importance. It initiates the kundalini and brings forth a state of bliss when chanted correctly. There is a particular rhythm with the breath and the sound. Hold neck lock while chanting. It is also known as the “Adi Shakti Mantra” and the “Ashtang Mantra for the Aquarian Age.” It is chanted without musical accompaniment. Great Macroself, Creative Self, All that is creative through time. All that is the Great One. Three aspects of God: Brahma, Vishu, Mahesh (Shiva), That is Waheguru. These are the words of Patanjali, the author of the Yoga Sutras. This mantra connects you with thousands of years of prayer. It opens your creative flow, allows you to unlock your intuition, and helps you to move beyond the old into the new, into the sunrise of your higher consciousness. Ek Ong Kar, Sat Nam, Karta Purkh, Nirbho Nirvair, Akal Moorat, Ajoonee, Saibung, Gur Prasaad, Jap! This is a mantra of enlightenment – these words will connect you to it. These were the first words Guru Nanak, the originator of Sikhism, offered when he emerged from 3 days of an exalted awakening within the water. From this illumination, his aura shone so brightly all could physically see that which is normally invisible. It is considered to be the highest of all the mantras. It contains everything. It will clear out all the old patterns – so you can shine in your fullness. We invoke our undying nature through these words. As we move beyond the concept of death, we move beyond our fear of endings. We move beyond the idea of defeat or failure. By uniting with our undying nature, courage imbues our being. Only Victory, only the Everlasting, continues in our consciousness with wisdom of the Infinite. God is merciful, and never forgets us. God guides us, giving us good people to help us. God does not allow hurt to come to us. I take comfort in the thought of God. This mantra is one of the most powerful mantras of protection. When we take refuge in the divine, all of our issues are taken care of. God will make sure that we have what we need, that our job will get done, and that all things less than beneficial shall be cleared from our path. As it is chanted, you can choose to sit in a particular asana for added benefit. Sit on the left heel. Bring the right knee up, right foot on the ground. The hands are in Prayer pose. Focus the gaze at the tip of the nose. Use props as needed. Or you can sit in easy pose, if this is too difficult. Guru is that which brings us from Darkness to light. Wahe is like “Wow!” It is an indescribable state of wonder. Ram Das literally means “God’s Servant.” We honor and invoke this service from the infinite as we chant it, with humbleness and thankfulness. Yogi Bhajan calls this the “Mantra of the Miracle.” Ram Das also refers to the 4th Sikh Guru, who was known for his humble service, his devotion, and for bringing healing and miracles. He showed himself in his etheric form to Yogi Bhajan to gift this as a personal mantra to him. You can chant to honor Guru Ram Das, or simply to invoke the qualities he embodied. At Sat Nam Fest East, we will have incredible musicians leading the Aquarian Mantras. Check out our schedule! If you want to learn the mantras beforehand, there are innumerable albums that feature the Aquarian Sadhana Mantras, from musicians such as Snatam Kaur, Gurunam Singh, Mirabai Ceiba, and many others. For other amazing Aquarian Sadhana tips, check out the book Original Light: The Morning Practice of Kundalini Yoga by Snatam Kaur. In this book, Snatam takes us into the heart of the path, as taught in the Aquarian Sadhana, its primary guide to daily practice. This book and 2 CD set offers Kundalini Yoga’s key principles, enriched by Snatam’s stories and insights as a lifelong practitioner. 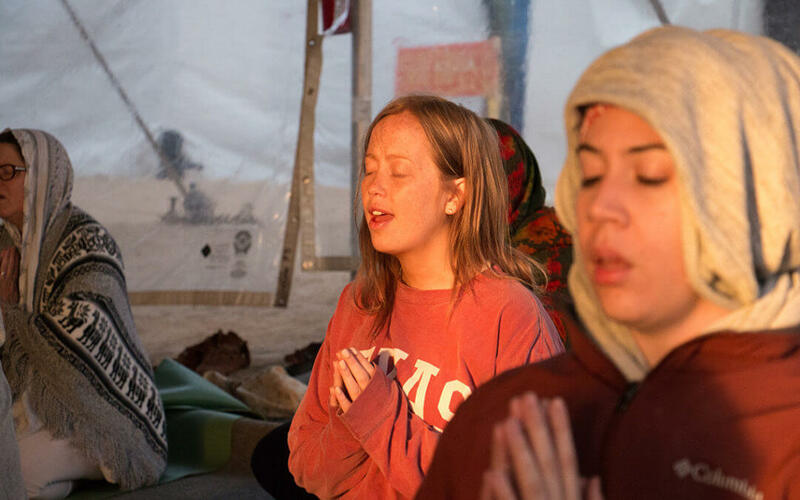 She then teaches its five stages of practice, including preparation, sacred recitations, breathing fundamentals, energizing yoga sets, meditations, morning chants, and more.